Premium chew clinically proven to reduce calculus when used daily in dogs. For use in dogs as a chew to help remove plaque and reduce tartar. · Provides a well-known antiseptic effect and helps remove plaque and reduce tartar. 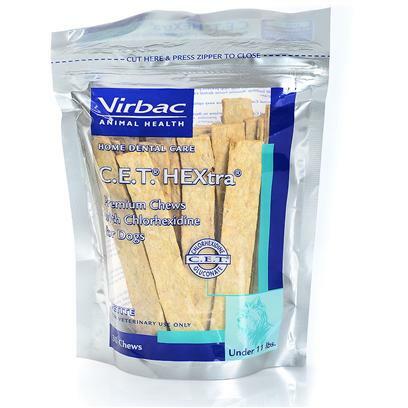 Chews are coated with exclusive patented 10% solution of chlorhexidine gluconate. · Contains beefhide for natural abrasive cleansing action. · Helps keep teeth clean and breath fresh, even on days when brushing isn't possible. · Persistent action. Chlorhexidine is released into the oral cavity during chewing and may be released for up to 24 hours, providing sustained antimicrobial action. · Appealing flavor. Dog owners may give as a daily chew.